Well, it’s been a few days since I last posted as I’ve been so busy. 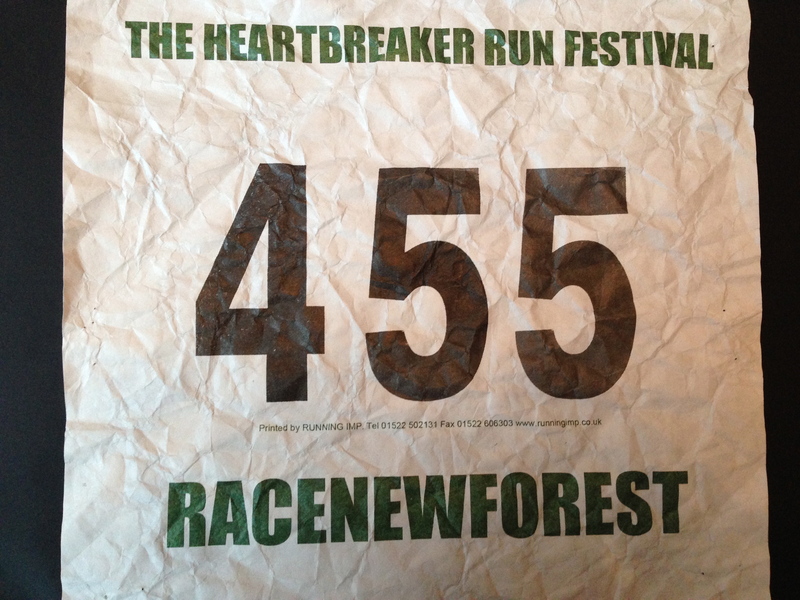 The big event on my birthday was the Heartbreak Half – a 14 mile race out in the New Forest that is known for its steep hills. The course had been altered slightly from last year’s route, but that didn’t make it any less tough. The start of the race is at the foot of an enormous mountain. Luckily I was aware of what was ahead, so I took it fairly steadily with Irene. The course wound its way out of the caravan park and out onto the main road. Just before the turn off into the forest, I noticed a runner making his way towards us on the road. He seemed to be running too quickly to be an early casualty, so it seemed odd that he was going against the flow of the runners… it took me several moments to realise that it was my husband who had run the 18 miles from our house to cheer me on. What a hero! During the race, several runners spoke to Irene and I including someone who ran Paris marathon last year. She told me that 80% of the runners are male, so women in the crowd are supportive whenever a woman runs past. Last year, I found the Heartbreak Half to be incredibly difficult. I struggled with hip and leg pain and ended up walking quite a few of the hills. This year I felt on great form and didn’t feel the need to walk at any time. I particularly enjoyed running down the final hill and am convinced that I could have run it at least 5 minutes faster than my eventual time. Anyway, I had decided to enjoy it as it was my birthday. I took it steady and still managed a PB. This has helped me to feel more confident that I can do well at Paris. In the evening, I had my first swimming lesson. I was incredibly nervous, but the instructor was friendly and reassuring. There are 3 other people in my group, an older lady called Victoria, a young Portuguese woman and a Chinese lad called Liu. Liu was absent, so there were only 3 of us. The first thing we had to do was to swim a length of crawl. I reminded the instructor that I can’t do it. He asked me to try. I managed to move from one end of the other by waving my arms around. It wasn’t as bad as I thought it might be, and the instructor thinks that if we can work on my breathing I should be OK. We did quite a few drills to focus on crawl breathing, including one that involved swimming on my side with one arm stretched out in front of me. I didn’t like it much as I was convinced that I would swallow lots of water. After a while spent on crawl, we did a couple of lengths of back stroke. This is the stroke that I find easiest as I don’t need to worry about my breathing. Unfortunately, I was too focussed on travelling down the pool quickly and didn’t spend enough time concentrating on my legs. I now know that I kick from the knees and not from my hips, so I will have to work on that. Next, we moved onto breaststroke. I was feeling quite confident that I would be able to hold my own for this part. The instructor told me that I need to slow down and not bring my arms in such a wide sweep. I thought I did really well, doing two strokes underwater and one stroke out… it was only when I spoke to Stuart in the evening that he pointed out that in competition your head must come out of the water once in each stroke. Doh! I never knew that before, so clearly there’s a lot that I have to work on. Overall, I think I made progress even during the one lesson as I feel more confident and understand a lot more about how each stroke should work. After swimming, I drove down to Sprinkles Gelato for my birthday treat of an ice-cream sundae. It broke all of my diet rules, but it was my birthday! On Monday evening, Irene and I were leading a circuit training session with our running group. Irene wasn’t confident about leading the exercises, so we agreed that she would devise various running/hopping/stepping exercises and lead half of the group through those. Half the group did an exercise while the other half ran and then they swapped. This seemed like a great idea until I realised that I would have to spend 45 minutes squatting and doing various other strength training exercises. I’m never impressed when an instructor expects people to do things that they wouldn’t do themselves, so I just had to grit my teeth and get on with it! On Tuesday and Thursday morning, I did Run Camp. It wasn’t too bad, but the squats were hard work after Monday evening. It’s quite nice that it’s getting lighter in the mornings, but a disadvantage is that The Common seems to be getting busier, so we have to move out of the way for bikes more often. I think the exercises are working as it was quite hard to do squats first of all and now I can do one-legged jumping squats. I didn’t swim on Monday morning as I was feeling exhausted, but I did swim on Wednesday morning. It seems odd not to be focussing on counting lengths and going as fast as possible, but I’m hoping that working on my technique will pay dividends in the end. I did quite a few arm exercises and tried to do a length of crawl, but I still feel very self-conscious. On Wednesday evening, I went to see Pete at YouMassageTherapy for a sports massage. The last few times I’ve visited, I’ve had holistic massages and deep tissue massages, so I had forgotten how painful sports massages can be. I really must get myself into the habit of stretching properly after running. Pete only focussed on my neck and thighs. I felt so bruised afterwards and was stiff on Thursday. I hope it’s doing me good. It was tempting to be lazy and skip my run on Thursday evening, but then realised that ‘Winners never quit and quitters never win’, so I laced up my shoes and headed out for the social run. There were quite a few people there, which was good. We did a run that went to The Common and then when we got there, we headed towards Glen Eyre before going back to Oasis. I managed to chat to quite a few different people, which was good. On Saturday, I had an entire day’s break from running as I was Run Directing at parkrun. It was a pretty stressful event as 2/3 stopwatches didn’t start. Fortunately, I was able to resolve it all in the end – phew! Yesterday, I managed to get myself back into the swing of things. I had planned to run to the CC6 (cross-country race) at Fleming Park with Kirsty and then run home again, but I came across two problems. Firstly, Kirsty was ill and unable to run. For most people, this wouldn’t be a problem, but I’m a social runner. I find it hard to run alone as I like to chat. My second problem was that Stu pointed out that he thought it was 7 miles to Fleming Park and I didn’t get myself ready on time. Yet again, I had to remind myself that I can’t quit now. I left home and realised that I’d just have to do the best I could. The route from my house to Fleming Park is mostly downhill, which was a relief. I was concerned that I might not get there on time. I had worked out a safe route, but it was quite long. Foolishly, I took my life in my hands and ran about half a mile down a busy dual carriageway to try to cut some of the distance. The roundabout by the motorway was quiet, so I was able to sneak across and managed to cut the distance down to 9.5km (under 6 miles). This meant I arrived with enough time to change into my trail shoes. As women’s captain of my running club, I am aware that some people expect me to be one of the club’s fastest runners. However, my role is to participate in events and encourage others to attend. I knew I wouldn’t be one of the scoring runners for my club, so I enjoyed the 4-mile route whilst chatting to Irene. Rob and Stu had done a long run, so they ran about half a mile of the route with us before they ran home. At the end of the CC6, I stopped long enough to congratulate the female runner from my club who won the series and for the men’s team to be crowned winners. I also ate a slice of cake before it was time for me to run home. My training schedule told me that I should run 20 miles. My Garmin is set in kms and I reset it at the start of each run. I didn’t do the maths properly and only ended up running 19 miles. This was annoying as I had enough energy to run another mile – grrr! Oh well, at least I was still feeling strong after running that far. In the evening, I had my second swimming lesson, which was even more of a success than the last one. We did a few lengths of crawl, backstroke and breaststroke, before doing some breaststroke drills. We had to do two kicks to each arm stroke. It felt odd, but my breathing worked better. Then we moved onto to trying butterfly. We also attempted tumble turns. We had to swim half a length, turn and then swim half a length back. My first half-length seemed OK until I remembered that I hadn’t been using my legs properly. The second half-length was better. The tumble turns and somersaults in the water were rubbish. I was afraid that I would get stuck underwater and drown. Victoria tried to reassure me by telling me that after the initial panic apparently drowning is a peaceful experience. That does not reassure me. I think I need to spend some time in a pool with Stu learning how to somersault. How I Went From Overtraining And Eating Bags Of 39 Cent Hamburgers To Detoxing My Body And Doing Sub-10 Hour Ironman Triathlons With Less Than 10 Hours Of Training Per Week. Oh well, I’d better publish this now, or I’ll never get back to date!! !